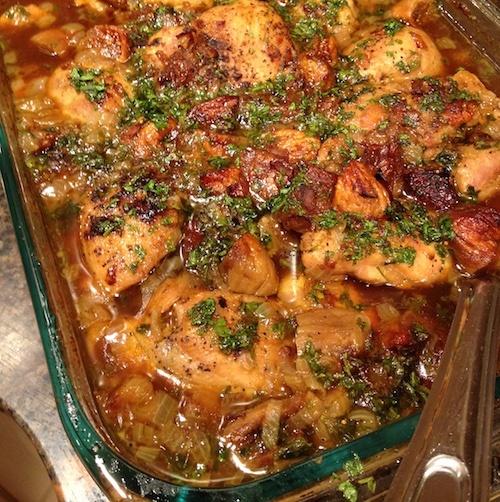 A Moroccan-spiced chicken dish lightly sweetened with dried figs. Preheat oven to 325. Salt and pepper the chicken thighs. Brown chicken in a large cast iron pan heated to medium in the cooking fat, cooking about 4-5 minutes each side. Place them in a single layer in a 9 x 13 glass dish. Add the onions to the cast iron pan and cook until golden. Deglaze with the red wine vinegar, then add the bone broth, figs, spices, and garlic. Ladle the broth mixture over the chicken. Put into the oven and cook for 30 minutes. Garnish with chopped parsley on top just before serving. This is excellent served over cauliflower rice or white rice.